Indispensable for anyone involved in vocational education or apprenticeships, this fully revised and updated edition of The Vocational Assessor Handbook includes new guidance on end-point assessment of the new apprenticeship standards, and the latest information on regulations and qualifications. 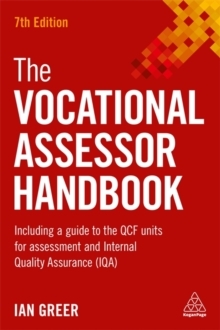 Containing the units and practical explanation for each stage of assessment and verification practice, it is the only comprehensive guide for assessors and verifiers of vocational qualifications. Packed with up-to-date, detailed and reliable information, The Vocational Assessor Handbook (previously The NVQ Assessor, Verifier and Candidate Handbook) contains a detailed guide to the QCF units for assessment and internal quality assurance (verification). For UK assessors of QCF qualifications and NVQs, verifiers, teachers, providers of training and work-based learning, assessors of apprenticeships and those working towards PTLLS, CTLLS, DTLLS qualifications, this complete guide is essential for qualification and ongoing practice, enabling you to: understand the principles and practices of assessment; assess occupational competence in the work environment; assess vocational skills, knowledge and understanding; understand the principles and practices of internally assuring the quality of assessment; plan, allocate and monitor work in your own area of responsibility.